I recently read about Aisam-Ul-Haq Qureshi of Pakistan qualifying for Wimbledon 2007 and feel great pride in this achievement. While tennis does not has the following in Pakistan similar to that of mainstream and popular sports like cricket, it still has a decent following. His name is listed at the fourth position in this list on the Wimbledon site. Pakistan’s top tennis star Aisam-ul-Haq Qureshi on Thursday created history by becoming the only Pakistani to enter Wimbledon through the qualifying rounds of the professional tennis. Aisam hit the limelight after winning third and final qualifying round against Canadian No. 1 Frank Dancevic in a four set thriller lasting for 2 hours and 50 minutes with a score line of 4-6, 7-6 (11/9), 6-2, 7-6 (7/4). The Canadian has been playing very well for the last three years and broke into top 100 in the world. 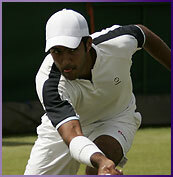 He has been playing Wimbledon main draw also regularly. Frank was the 4th seed of the Wimbledon Qualifying draw and a favourite to qualify today but Pakistan star had other plans and managed to defeat him, said a facsimile message made available to APP here. 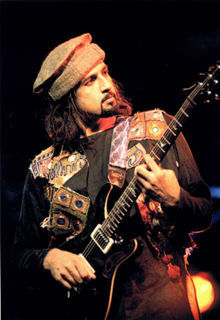 Recently, Salman Ahmad, a former band member of a musical group, Junoon, which is South Asia's biggest and most senior rock band, made some public statements which are reproduced below. Formerly, he was also a part of another popular musical group named Vital Signs. He is a doctor, a music artist and an actor. I hope this statement by him helps MQM supporters make a sensible choice in the next elections. Altaf Hussain and his murdering accomplices deserve to be tried for their crimes against Pakistan. I’ve been threatened by them on many occasions in the past 15 years. One particular time was when I refused to perform at Altaf’s marriage function in Karachi and London where all the other artists, including Ali Azmat, were browbeaten to go and perform for his “Majesty’s” pleasure. The man who threatened me was called “Khalid bin Walid” who was a known terrorist and a murderer. He told me that Altaf Hussain, “his Quaid” had especially demanded me to appear with Junoon to perform at their ceremony function. When I refused to comply he called up my staff and my sound company guy, Ishtiaq Ahmed,and threatened them with dire consequences if I didn’t go. Ishtiaq pleaded with me to go and perform or risk being killed,and all this OVER REFUSING TO PLAY AT A MARRIAGE FUNCTION! As fate would have it,I’m still alive, but Mr. Walid was killed a few weeks later in a shoot-out in Karachi with Haqiqi activists. (Those who live by the sword die by the sword). In 1992,they also threatened to abduct my wife and children if I didn’t show up at an MQM rally and welcome their leader Azim Tariq. I still live happily with respect and dignity but alas Azim Tariq was also was killed in a mob feud. My friends, Junaid Jamshed and Sajid Hassan worried for my safety told me that I’m putting my family at risk every time I refuse to obey these goons and on every occasion I told him that if I give into their terror tactics I can not call myself a Muslim. Allah (SWT) is our protector and He has commanded us to stand up against injustice and that is why I applaud Imran Khan for speaking the truth about Altaf Hussain and his goon squad. I think the time has come for all Pakistanis to stand up and be counted. Do you want to live as a citizen of a country with dignity and all your rights protected or as a slave in someone’s fiefdom? There is also a Q&A session with Salman Ahmad below. I first read about this here. Q1: You recently stated in the press that MQM leader Altaf Hussain has threatened you on a number of occasions. Have you ever taken a legal action against him? If not, why? If yes, what happened? Salman Ahmad: Altaf Hussain is not courageous enough to threaten me directly…he gets his goons to do the dirty work.The first time I was threatened by the MQM was in the early 1990’s when their armed activists told me to go on stage and welcome their then local leader Azeem Tariq at the KMC sports complex. When i refused they threatened to abduct my wife and children. Then they called my house repeatedly and told my father and wife that they will shoot me if I continue to perform in Karachi. I took the threat very seriously and called the Sindh police who sent officers to protect my family residence. I didn’t make it a public issue then because the media was also intimidated by the MQM unlike the Pakistani media now which is strong and independent.